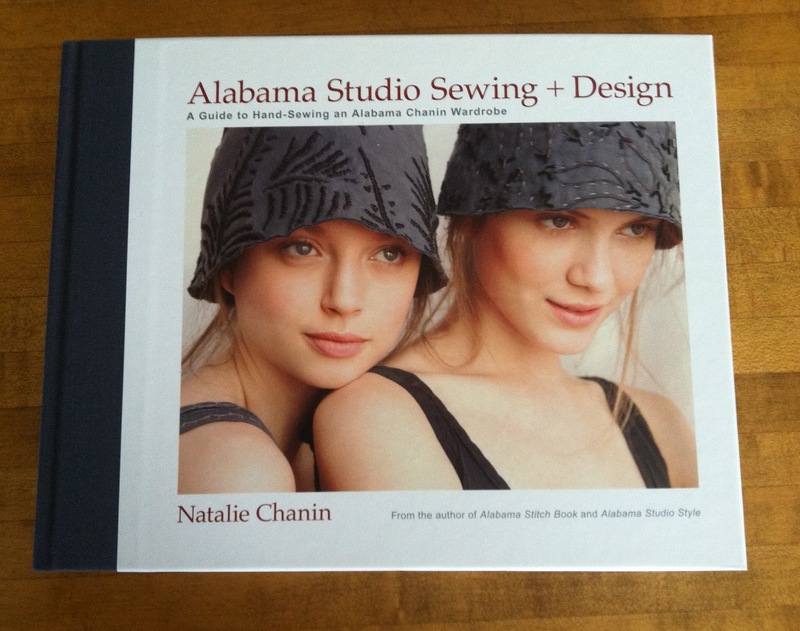 I was so excited to get my copy of Natalie Chanin's new book - Alabama Studio Sewing +Design. What I love about Natalie Chanin is how she shares so freely what every other company would jealously guard. I admire her whole ethos and it makes me happy to think of the collective of women sewing away to make the exquisite clothes that Alabama Chanin make and sell. What really thrills me is that it is all done by hand - can you imagine the hours of work that go into every garment? 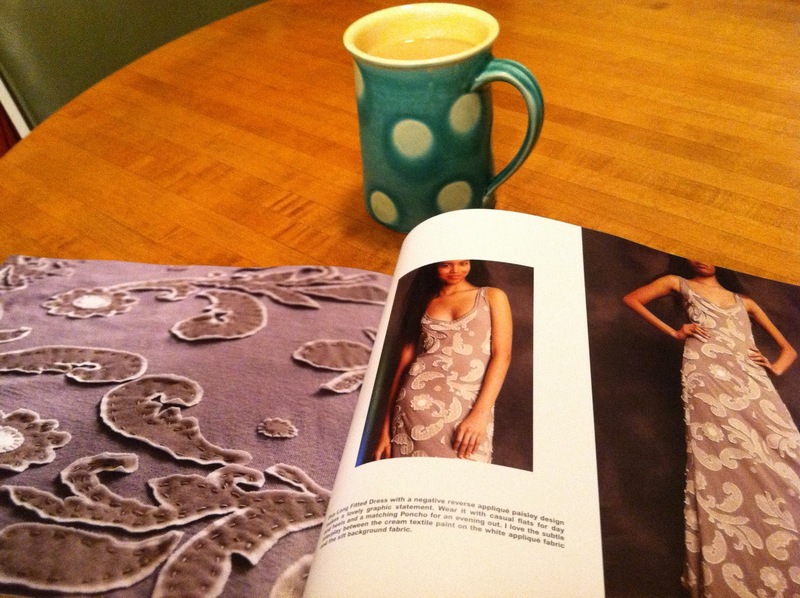 The book is beautiful - full of wonderful photos and very detailed information on how to replicate the clothes. I managed to get a quiet moment to sit down and read through it with a lovely cup of tea - although, I suppose it is more of a giant mug of tea. Well, I am English after all and we do love our tea. I love this mug which I got from the lovely Bettina Kleemann at the Sawdust Festival in Laguna Beach. Bettinna has her studio in Venice where she hand throws her ceramics. You can see her work on her website -Beyond Blue Ceramics. I have to say it does make me very happy when I drink out of my mug. It is well worth checking out the Alabama Chanin website and looking at all the wonderful garments for sale. You can see why the prices are so high when you see up close how much work goes into every piece. You can also buy everything you need from the Studio Store to make your own - the fabric, thread, stencils, beads, etc. You can even buy Do it Yourself Kits where all you have to do is pick the colour of fabric and the kit has everything in it you need to make your chosen item - all in one happy package! How great is that! It is my mission to try and make a least one piece this year. I would love to take one of the workshops - it is on my list of things I would love to do - one day, when I have enough time and money. I would also love to meet Natalie Chanin - reading her Journal is a real treat and gives you an insight into what makes her tick, what inspires her and the wonderful people that she surrounds herself with. Hmmm - can you guess that I really love Alabama Chanin! It feels as if I have fallen down a rabbit hole of craziness - the only reason I have the time to post today is because I have a poorly child sleeping on the sofa! Poor baby. Oh, and a translation of poorly means sick. I overhead my daughter telling a classmate that her Poppa was poorly and the child thought that she meant he was really poor! So funny. Anyway, the last several weeks have been more chaotic than usual as we now have a new home! At last! Yippee! It is over a year since we sold our house in the UK and we have lived with family there and here ever since. Our furniture is being delivered next Tuesday - and although I have wished several times that the boat would have sunk or at least our container would have been washed overboard, it will be lovely to have our own things around us. I have been a painting maniac trying to get the house ready before the furniture arrives. The new carpet was fitted on Wednesday. The house has Saltillo Mexican tile and because the tiles are so many different colours we have matched the carpet to the grout which is a dark grey. I am very happy how it has worked out, as ideally in a perfect world I would have a polished concrete floor - not everyone's cup of tea but I just love it. 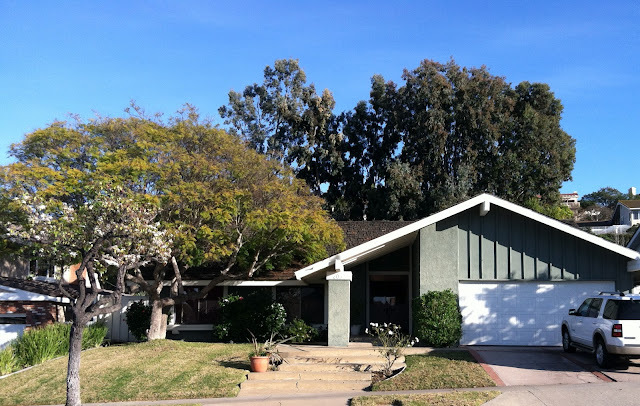 I am not a huge fan of the Saltillo tile but needs must and I think we can make the most of it. Just a sample of what I have been working on - they are all nearly finished. 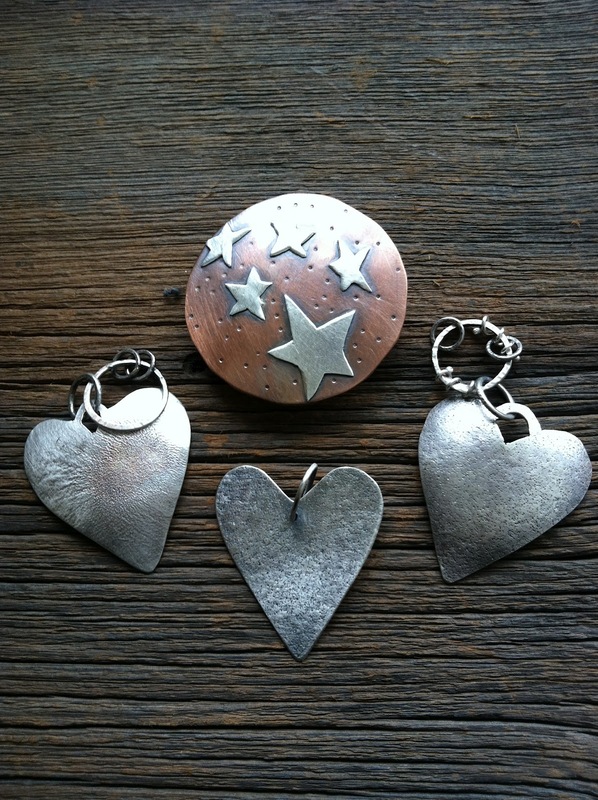 The copper piece with the silver stars is a belt buckle and I am really happy with how it has tuned out. The three hearts are all going to be pendants. I have a lovely amethyst ring which is near to completion and I am working on a bezel for a large necklace. Hopefully, life will calm down over the next few weeks and I can get busy creating. I have given up being rubbish for lent - so, finger crossed, I will be posting more frequently. One of the Mothers from my daughters school asked me to take a look at a movie that her brother, Daniel Hsia has made. She told me that is was an independent film, and I have to be honest, my first thought was "Hmmm, this may not be so good." I think in England an independent film can mean something else, maybe a film that is more artsy. Anyway, I watched the trailer and I was blown away. It is a "proper" film! I would most definitely pay to see it at the cinema. Check it out and see for yourself, it is called Shanghai Calling.